In honor of its 30th anniversary, two-time Academy Award®-winner “The Little Mermaid,” a musical tale of mermaid princess Ariel — along with Sebastian and Flounder, and the love-to-hate sea witch Ursula — will make a splash for the first time Digitally in HD, 4K Ultra HD and Movies Anywhere on Feb. 12, and then on 4K Ultra HD and Blu-ray™ on Feb. 26. Never-before-seen bonus features bring legendary composer Alan Menken and some of Disney’s most recognizable leading ladies together around a piano to reminisce, sing and celebrate “The Little Mermaid.” The latest installment of “Stories from Walt’s Office” compares Walt and Ariel’s love of collecting treasures. Viewers will also receive an inside look at the “The Little Mermaid” cast in their original recording sessions, explore hidden treasures and fun facts from the film, and enjoy a special performance of “Part of Your World” by a cappella singing sensation DCapella. Features the voice talents of Jodi Benson (“Toy Story 2,” “Toy Story 3”) as Ariel, Pat Carroll (“Laverne & Shirley”) as Ursula, Samuel E. Wright (Broadway’s “The Lion King”) as Sebastian, Christopher Daniel Barnes (“The Brady Bunch Movie”) as Eric, Kenneth Mars (“Young Frankenstein”) as Triton, Buddy Hackett (“The Music Man”) as Scuttle, Jason Marin (“Back to the Future”) as Flounder and René Auberjonois (“The Patriot”) as Chef Louis. 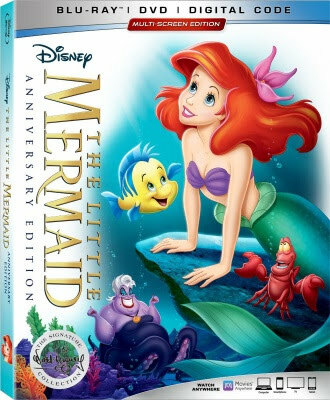 “The Little Mermaid” is the seventh title to join the Walt Disney Signature Collection. The film was originally released in theaters on Nov. 15, 1989 and is the 28th film from Walt Disney Animation Studios, and the first in what many described as a new Disney animation renaissance. My son loved this movie, he played the VCR tape over & over.